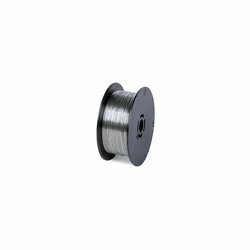 Pioneers in the industry, we offer aluminum metallizing wires, aluminum thermal spray wire, aluminium tea bag wire, aluminium chub wire, aluminium metalizing wire and aluminum tea bag wire from India. 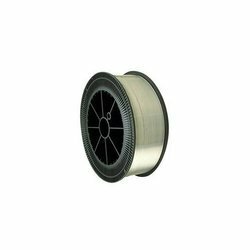 We are one of the Leading manufacturer, supplier and exporter of Aluminum Metallizing Wires in India. Offered array of high purity Aluminum Wire is majorly used for Metals Spraying & Vapor Metalizing. These products are manufactured from highly pure, virgin quality Aluminum ingot through Casting & Rolling Process. Our product range is available in various sizes from 9.50mm To 1.6mm with tolerance of +0.00 mm & -0.05 mm. Apart from this, the chemical composition of Aluminum Wire Refer Standard ASTM B 233. 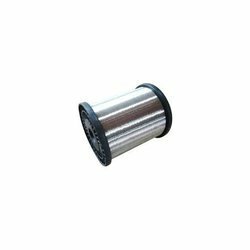 We are one of the Leading manufacturer, supplier and exporter of Aluminum Thermal Spray Wire in India. Offered array of high purity Aluminum Wire is majorly used for Metals Spraying & Vapor Metalizing. These products are manufactured from highly pure, virgin quality Aluminum ingot through Casting & Rolling Process. Our product range is available in various sizes from 9.50mm To 1.6mm with tolerance of +0.00 mm & -0.05 mm. Apart from this, the chemical composition of Aluminum Wire Refer Standard ASTM B 233. 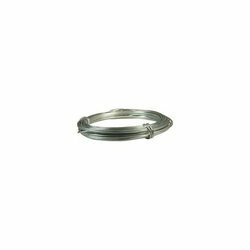 We are one of the Leading manufacturer, supplier and exporter of Aluminium Tea Bag Wire in India.Offered array of high purity Aluminum Wire is majorly used for Metals Spraying & Vapor Metalizing. These products are manufactured from highly pure, virgin quality Aluminum ingot through Casting & Rolling Process. Our product range is available in various sizes from 9.50mm To 1.6mm with tolerance of +0.00 mm & -0.05 mm. Apart from this, the chemical composition of Aluminum Wire Refer Standard ASTM B 233. 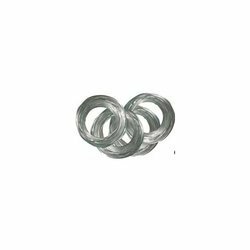 We are one of the Leading manufacturer, supplier and exporter of Aluminium Chub Wire in India.We are the principal manufacturer and exporter of broad assortment of Aluminium Chub Wire. Offered array of high purity Aluminum Wire is majorly used for Metals Spraying & Vapor Metalizing. These products are manufactured from highly pure, virgin quality Aluminum ingot through Casting & Rolling Process. Our product range is available in various sizes from 9.50mm To 1.6mm with tolerance of +0.00 mm & -0.05 mm. Apart from this, the chemical composition of Aluminum Wire Refer Standard ASTM B 233. 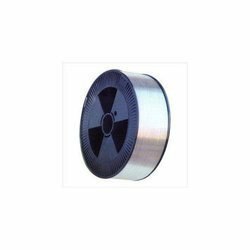 We are one of the Leading manufacturer, supplier and exporter of Aluminium Metalizing Wire in India.Offered array of high purity Aluminum Wire is majorly used for Metals Spraying & Vapor Metalizing. These products are manufactured from highly pure, virgin quality Aluminum ingot through Casting & Rolling Process. Our product range is available in various sizes from 9.50mm To 1.6mm with tolerance of +0.00 mm & -0.05 mm. Apart from this, the chemical composition of Aluminum Wire Refer Standard ASTM B 233. We are one of the Leading manufacturer, supplier and exporter of Aluminum Tea Bag Wire in India.Offered array of high purity Aluminum Wire is majorly used for Metals Spraying & Vapor Metalizing. These products are manufactured from highly pure, virgin quality Aluminum ingot through Casting & Rolling Process. Our product range is available in various sizes from 9.50mm To 1.6mm with tolerance of +0.00 mm & -0.05 mm. Apart from this, the chemical composition of Aluminum Wire Refer Standard ASTM B 233. 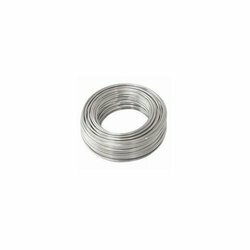 We are one of the Leading manufacturer, supplier and exporter of Chub Wire in India.Offered array of high purity Aluminum Wire is majorly used for Metals Spraying & Vapor Metalizing. These products are manufactured from highly pure, virgin quality Aluminum ingot through Casting & Rolling Process. Our product range is available in various sizes from 9.50mm To 1.6mm with tolerance of +0.00 mm & -0.05 mm. Apart from this, the chemical composition of Aluminum Wire Refer Standard ASTM B 233.